As engineers and related professionals, you have the opportunity to enhance your careers through off-campus courses from the University of Maryland offered through DETS. DETS has been delivering graduate level Engineering education to distance students since 1980. We are an extension of the A. James Clark School of Engineering at The University of Maryland. 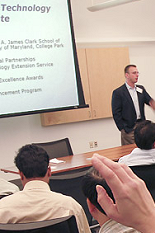 DETS delivers graduate and undergraduate engineering programs and specific short courses, seminars and lectures to individuals and organizations throughout the world, as well as providing students and faculty on the College Park Campus with technology and associated services designed to complement the on-campus learning experience. DETS uses the latest technology to deliver campus classes to students at a distance. These courses are delivered via Videoconference or via streaming media over the web. Engineering professionals learn from some of the most respected Professors in their fields. Our hybrid system uses reliable and flexible delivery methods that offer quality instruction. DETS has established Videoconferencing centers around the state so there is a center located conveniently near you. Our Streaming media is available 24/7 at your work station, your home computer, or your mobile device. No commute to campus: Since DETS has established centers around the state, you are not required to commute to the College Park campus for your regularly scheduled classes. All course materials are available via the web or are delivered to the center where you are registered. All of the courses delivered via DETS are Web Enhanced courses and offer lecture videos posted to your courses' web pages within 24 hours of class. These lecture videos offer a great supplement to the live class experience. Some programs are Online Programs can be completed entirely online. Contact the department you’re interested in studying with, consult with an advisor and then apply for admission to the program. Once admitted, you can register for classes online using testudo and come to one of our centers to attend class. If you have registration questions contact your Graduate program directly.